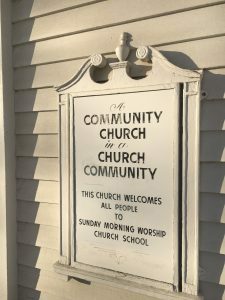 The Congregational Church of Hollis has played a major role in the community for more than 270 years. 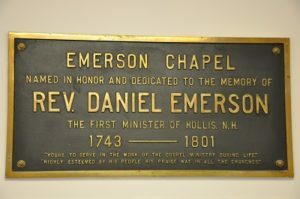 Its influence has been both spiritual and political since early Hollis settlers built the first meeting house in 1741 and the Parish ordained Daniel Emerson on April 20, 1743 as its first pastor. When Hollis was incorporated in 1746, the town assumed all financial responsibilities and the church’s name was changed from the Second Church of Dunstable to The Church of Christ of Hollis. 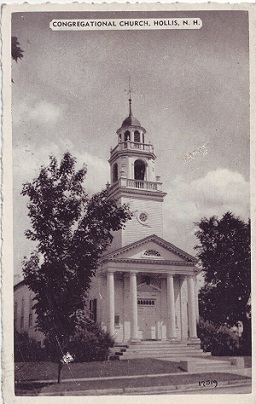 A second larger church, was raised on August 13, 1746. To finance it, “pew ground” was sold and in the years that followed, the parishioners built their own pews and completed the rest of the building. In 1880, the town offices, church and library shared the same building. After the town hall was built in 1887, the Grange leased the church’s auditorium from the town for 99 years at $20 per year. The church kitchen and dining room were used by the town, church, and Grange for public dinners. Until its own building was erected in 1910, the Hollis Social Library was housed on the east side of the church. The wing on the west side was completed in 1965 and in 1999 the building was renovated to include an elevator making it fully accessible. Today, we continue to strive to be a welcoming community of worship for all.